Riverview Manor environmental services manager Crystal Post, dressed as the “quiz master,” poses in front of the home’s “hand tree” on Oct. 21, 2016 during Infection Control Week. Crystal recently received the home’s Inspired Leadership Award. You can often find environmental services manager (ESM) Crystal Post demonstrating leadership in activities and events that help promote the spirit of Riverview Manor, her colleagues at the Peterborough long-term care home say. This is why Crystal’s co-workers nominated her for OMNI Health Care’s Inspired Leadership Award. Working in a long-term care home was a new experience for Crystal when she joined Riverview Manor 10 years ago. Before starting a job as Riverview’s nursing administrative services manager (NASM), Crystal worked in the manufacturing sector. 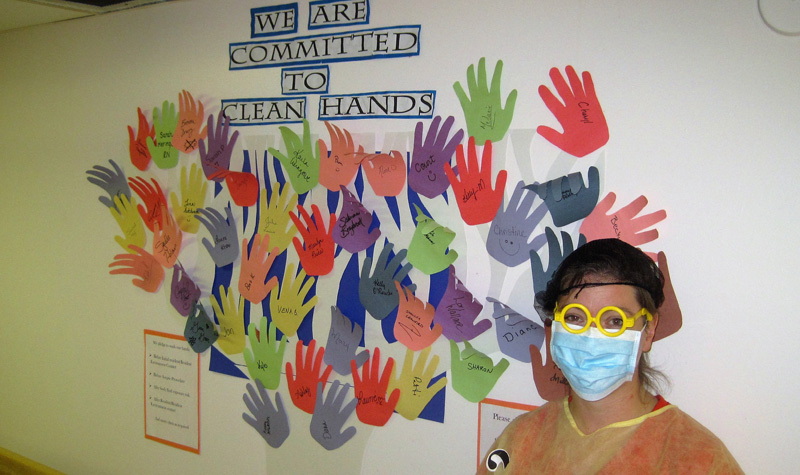 She fit in right away at Riverview Manor and has spearheaded many activities and events involving the home, from barbecues to the annual Big Bike fundraiser for the Heart and Stroke Foundation to leading the charge during Infection Control Week, her colleagues say. Crystal became environmental services manager when Faye Hetherington retired in April 2015. “Crystal performed very well in the challenging, multifaceted role of NASM, earning respect from all staff,” say Riverview Manor team members in nominating Crystal for the Inspired Leadership Award. Crystal was presented with the award at a recent ceremony held at Riverview Manor. OMNI Health Care’s Inspired Leadership Award is presented to staff members from each of the organization’s 18 long-term care homes. The accolade recognizes people who demonstrate OMNI’s mission, vision and values. Inspired Leaders also possess outstanding leadership skills and are committed to their work.